Take charge of your client’s online reputation – and do it the easy way. Our reputation management solution provides you with everything you need to build, manage, and promote your client’s online presence. Who says you need to scavenge the entire web to make your client’s business known? With Listings Management, you can easily find and optimize your client on all relevant business listings. No missed listing, no inaccurate business information – it all starts with this tool. Put their positive feedback to good use and provide your clients with more plus points for credibility. The Feedback tool allows you to get and display feedback from customers in different ways. It’s not just about the buzz — it’s about staying on top of it. If customers are talking about your client, they need to know. That’s where the Mentions tool comes in. Your Clients Care About Their Reputation — You Should, Too. The moment you stop caring is the moment clients will stop coming. Good reputation management is your foundation for boosting your client’s visibility. Make sure you’re doing it right. All 4 tools in one dashboard — clients can have access to the tools, so they can see the progress of their campaign. Offer clients a new solution to help their business grow, and scale your agency in return! All brandable resources and operational support are readily available the moment you sign up for this service. Don’t take our word for it. 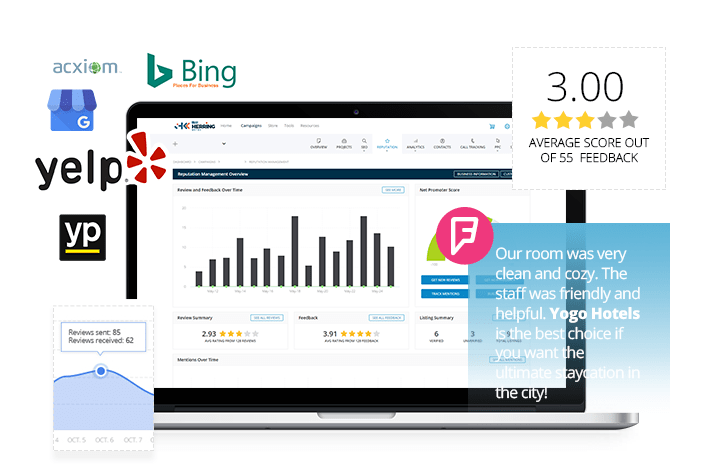 See how the tool works with a free 14-day trial for one business location upon signing up! Ready to Take Control of Your Client’s Reputation?